Born in England, Toni studied at Elmhurst Ballet School. Her professional career began in Germany working with notable choreographers such as Lothar Hofgen, Anthony Taylor, Nils Christie and Ottavio Cintolesi. 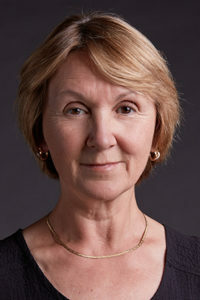 She co-founded the Eugene Ballet Company in 1978 with Riley Grannan and, to date, has choreographed more than 60 works for the Eugene Ballet Company. Many of those productions have involved collaborations with composers, literary and visual artists and local arts organizations including Orchestra Next, Eugene Concert Choir, Eugene Opera, Oregon Bach Festival, Oregon Mozart Players, The Shedd Institute for the Arts and the University of Oregon School of Music and Dance. Under Toni’s leadership, the Eugene Ballet Company has toured to 32 states and internationally to Taiwan and as part of a United States Information Agency (USIA) Tour visiting India, Sri Lanka, Bangladesh, Syria, Jordan and Tunisia. Her creative work has brought her a number of awards and fellowships, including two Oregon Arts Commission Artist Fellowship Awards and a National Endowment for the Arts Choreographer’s Fellowship Grant. Toni’s work has been performed by many ballet companies in the United States including Atlanta Ballet, New York City Ballet, Indianapolis Ballet Theatre, Pacific Northwest Ballet, Ballet Omaha, Washington Ballet, Nevada Dance Theatre, Oregon Ballet Theater, Ballet NY and Kansas City Ballet.